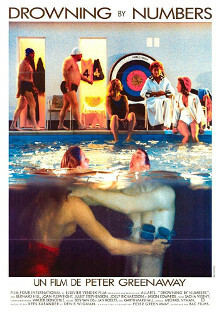 I composed the soundtrack to Peter Greenaways's film DROWNING BY NUMBERS in 1987. The director's instructions for the music for THE DRAUGHTSMAN'S CONTRACT (1982) had concerned the provision of a (Purcell-based) composition for each of the twelve drawings, and for A ZED AND TWO NOUGHTS (1985) the provision of a composition for each of the eight stages of Darwian evolution. The instruction for DROWNING BY NUMBERS was even more direct: all my music should be derived from Mozart's - from the slow movement of the SINFONIA CONCERTANTE in E flat K364 which Greenaway used in its untransformed form to 'celebrate' the deaths of the three husbands each murdered by his wife. Peter Greenaway and I had already plundered this music for his 1979 film THE FALLS where the brief titles music for each of the 92 characters was derived from the gorgeous tune in E flat that ends the 'exposition' (bars 58 - 62) with a chord progression - an interrupted I -VI - IV - V - I which marginally links classical music with doowop. For the DROWNING BY NUMBERS soundtrack I decided that while I would obviously revisit this favourite theme (which I also pilfered to represent The Woman Who Had Three of Everything in my first theatre piece THE MASTERWORK / AWARD-WINNING FISHKNIFE, also in 1979) the whole of this rich and suggestive movement was ripe for recomposing. Like the majority of my film scores, DROWNING BY NUMBERS was written for the Michael Nyman Band, and for the chamber orchestra version I have reworked six movements from the original of which half (nos 1, 3 and 5) feature solo violin and viola, which in the soundtrack appear only in Trysting Fields. When I started analysing the musical structure of the slow movement I noticed that Mozart consistently used two decorative tricks of which the first - accented appoggiaturas - provides the complete substance of Trysting Fields. Basically, I 'sampled' each of these appoggiaturas (for instance, from bars 10, 12, 14, 18, 20, etc.) repeated it three times (to represent the three wives?) and moved on to the next one so that a totally new harmonic/melodic continuity is created which is so familiarly Mozartian but yet which self-evidently is not. A short coda introduces another familiar trick of this score - the use of the E flat - C - A flat - B flat etc. sequence simultaneously in diminution (melody) and in real time (harmony). Follows Trysting Fields without a break and grows from THE HARMONY and THE MELODY. From time to time it shifts into an apparent harmonic retrograde (C - E flat - B flat - A flat etc.). Related melodically to Mozart's opening theme, and harmonically to its first C minor form and its later (bar 62 ff) E flat major reading. Middle section: THE MELODY and THE HARMONY meet their rock 'n' roll destiny. THE HARMONY seen from yet another viewpoint, now in C major. THE BASS LINE simultaneously as bass line and melody in diminution (taking its cue from the end of Trysting Fields). Also in quasi-retrograde mode. Like Trysting Fields this movement is built from the other decorative elements with which Mozart (subconsciously?) unifies his slow movement, this time not harmonic/melodic (the appoggiatura) but purely melodic, - a little twisting figure which drifts towards the barline (whereas the appoggiatura is always placed on the downbeat). Again I sampled all occurrences of this figure, repeated each three times and arranged them in a cut-up form in the order of their appearance. The second half of the piece develops this same material autonomously so to speak, and ends with a combination of the prevailing figuration laid over THE THEME in its most elevated C major manifestation.